The lyre is an ancient stringed instrument with the strings attached to a yoke with the soundchest on the same plane. Perhaps a better but less common description would be to liken the lyre to a long-horned bull with a bar between the tops of his horns and the strings running from the bar to the head (the soundchest). It dates back at least as far as the third millennium B.C. in Mesopotamia and appeared in the Greek world in the earliest times. Greek Mythology has it being invented by Hermes with its greatest exponent being Orpheus. With its big brother, the Kithara, it became the most popular instrument of the classical Greek and Roman cultures. It managed to sidestep the early Christian disfavour of non-vocal music and began appearing in Christian Europe in the late 7th century, aided by its increasing regard as the instrument of King David. The number of strings increased from three or four to seven. Illustrations have the player seated, his left hand against the strings, his right hand holding a plectrum. The lyre is still played as a folk instrument in and around Ethiopia. 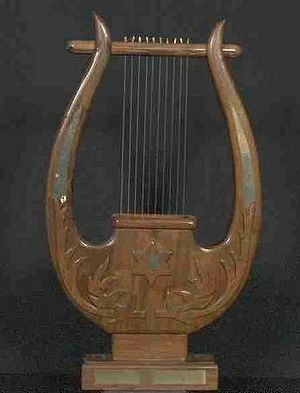 The term, lyre, gives its name to the adjective "lyric", and adverb, "lyrical". Both, originally, were to do with music; in particular, song. (The words of a song are commonly called the lyrics.) A piece of lyric poetry was that which could be sung. A lyric voice (usually tenor or soprano) is one suited to music that is light, tuneful and usually non-dramatic. This page was last modified on 17 September 2016, at 00:17.